Like a conductor, Faradiba Anuar orchestrates unique floral compositions, creating harmony with unexpected choices. Her plucky nature has led Faradiba to turn a long-time hobby into a blooming business. There is more to a Flora Hera arrangement than meets the eye. Although they are always carefully crafted, they never feel fussy or over-styled. Here is her story. Best described as a “garden in a bouquet”, a Flora Hera floral composition is visually distinct. 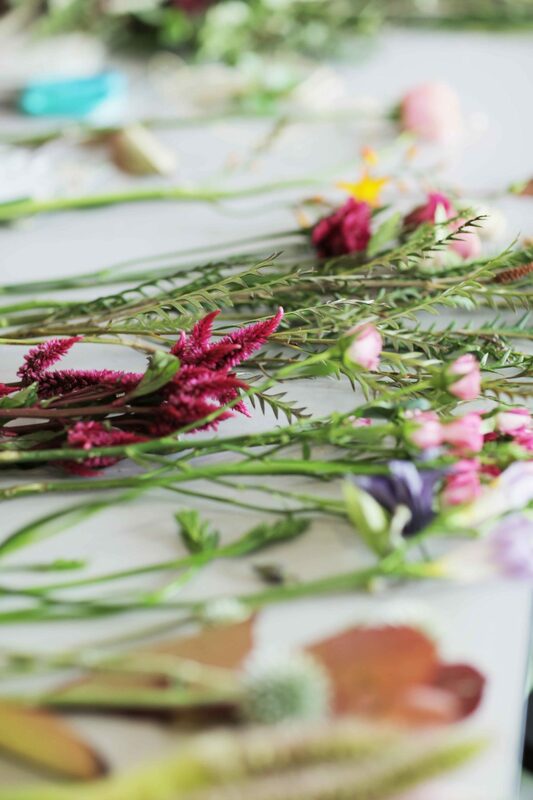 Unlike traditional arrangements, Flora Hera’s designs always feels organic, open and natural. While they may look effortless, founder Faradiba Anuar takes two hours on average to carefully craft a single piece of work. Like a conductor, Faradiba orchestrates unique floral compositions, creating harmony with unexpected choices. Typical floral designs are more methodical and structured, tend to be more uniformed in shape, and only incorporate foliage or greens at the end of the bouquet. Flowers are usually cut to uniform length and style and they are packed tightly, their “cheeks” pressed against each other, offering a very dense look. Generally, one focal flower or colour defines the arrangement and looks consistent from every angle. But Fara has a different formula. 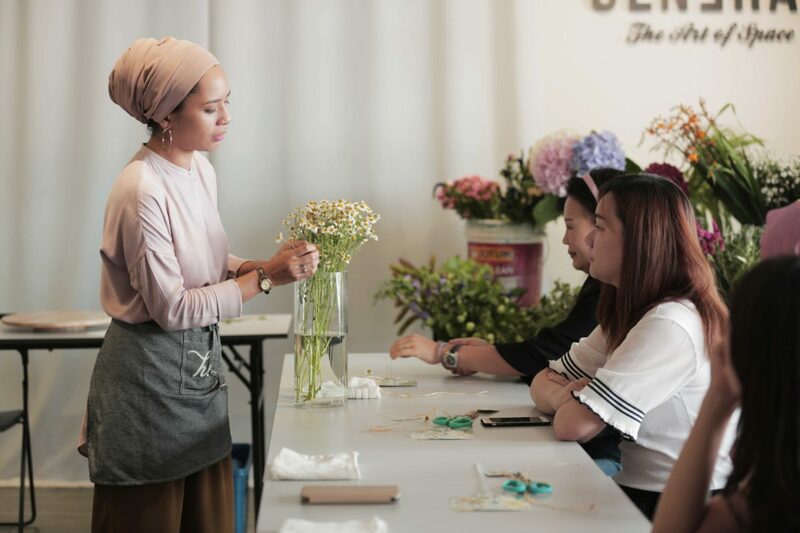 “Within my first year of being a floral artist, I noticed that my flower arrangements looked a little bit stiff because I had the tendency of squeezing them together. 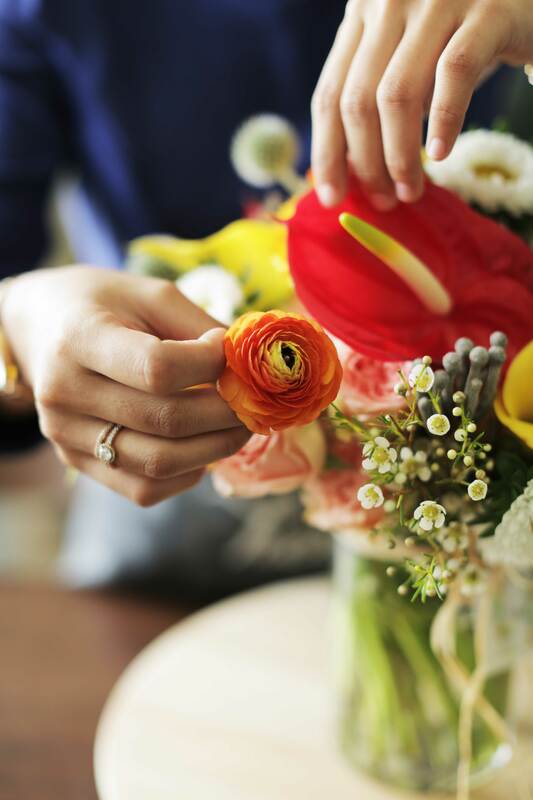 I observed the style of other florists and developed my own style of arrangement,” she says. Using primary, secondary and tertiary flowers, she fashions her arrangements in a radial or circular order, incorporating greens as she goes along. Every individual flower carries specific characteristics, but must ultimately work harmoniously in the final arrangement. For primary flowers, she may choose to work with hydrangeas, peonies or orchids. Less prominent flowers like roses or carnations are used as secondary flowers, with dusty millers, silver bunias and berry sprays as tertiary choices. Despite the unorthodox choices, her arrangements manage to sing in concert once completed. Faradiba started gaining a following and in 2015 began offering workshops. Perhaps being a primary school teacher and being self-taught herself, Fara always felt compelled to share her knowledge and design approach with others. Her classes are almost always booked out within a few days, with a long waiting list of would-be participants. 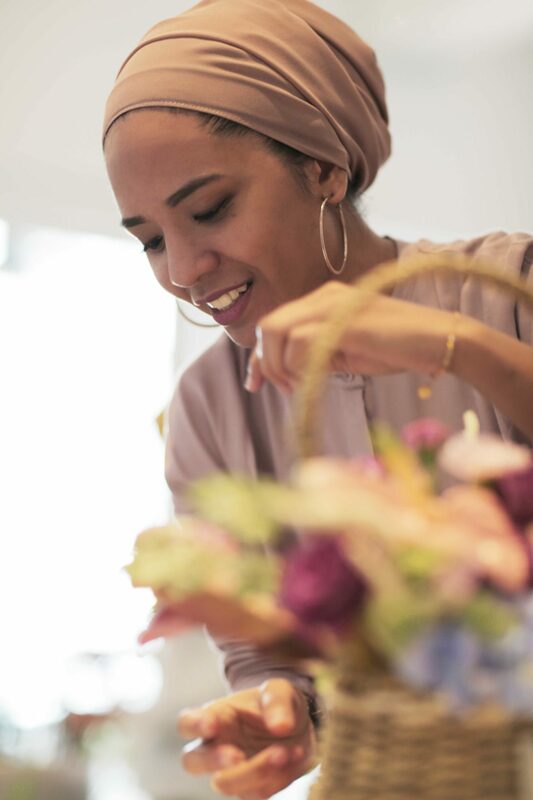 Through her hands-on approach in classes, Faradiba pushes the boundaries on the perspective of what floral arrangements should be. In her lessons, Fara incorporates what is known as a “flower salutation”. Taking reference from Singaporean botanical artist Lucinda Law, Fara wants to instil an appreciation of each flower’s detail. Rather than focusing on a beautiful end product, she wants students to pay attention to every single element in their arrangement. Although she’s encouraged by the strong demand for her workshops, she encourages prospective students to attend other courses as well. She believes that learning is a never-ending journey and thinks it is important for each student to explore a range of techniques and approaches to floral arrangement before settling on their personal style.